So whaddya think? Did any of you do something that didn't technically "match" but works for what you want? Holy Crikie - that's gorg! Greetings from two photographers in Atlanta, GA. I found your blog today on the 2010 top 100 list. Can you post some pics of just the band? SO i can see how flat it is, etc?! Your ring is gorgeous! The band is the perfect size too! Holy crap! I'm blind! I'm sorry, give me a moment to pick myself up off the floor. That ring is freakin' gorgeous! So so lucky! OMG your ring is absolutely beautiful. I am running into the same problem with finding a band to fit my ring....same thing. I don't want something to take away from my ring, but I want something that matches. 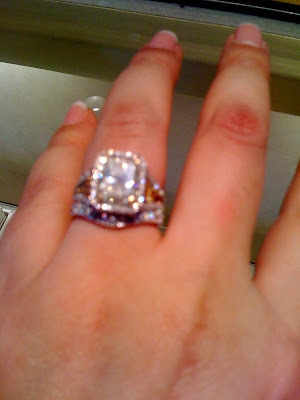 Mine is a Michael M ring and they have a matching band but I have small hands and it takes away from the ring. I tried on plain bands, hopefully I will find something like yours and have it be the perfect fit. I thought the dress was going to be the hard part....lol. Your ring is a STUNNER!!! I have a yellow diamond too and I just love it to pieces. I have an oval shape with a diamond halo (i think that's what it's called) and didn't think a contoured wedding band would look nice or modern, for me. I have a diamond wedding band, similar to yours and it's perfect. I can't stop looking that ring. It's gorgeous. It's definitely a timeless piece of jewelry. 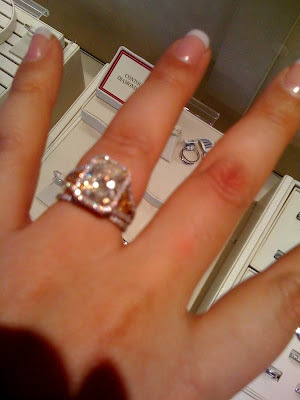 I'm stunned with this ring as well. It's so fabulous. I would love to have that on my ring. This is definitely one of the best jewelries I've seen so far. Congratulations, that rock on the ring looks huge. I hope you both had a great time.